Cut a shape out of niobium sheet and saw out an interior shape. This frame will be textured with hammer and anodized your chosen colors. 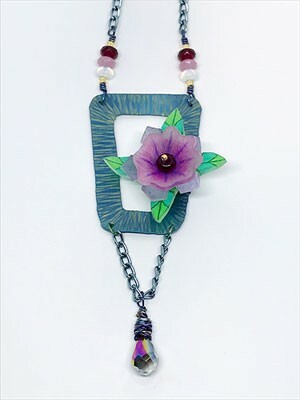 With Shrinkets molds developed by Julie Haymaker you will create a flower to attach to the frame with wire wrapping. Add dangles and a chain then wear it with pride.